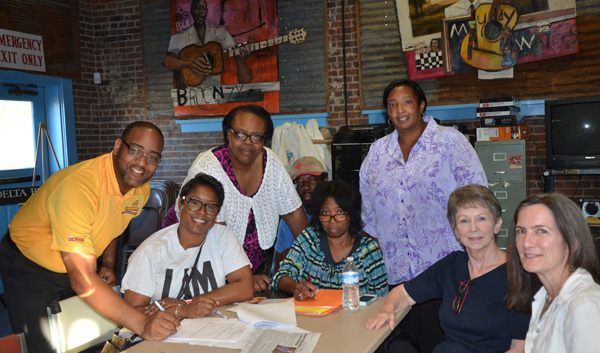 All smiles over news of a $4,500 Mississippi Arts Commission grant supporting the 31st Sunflower River Blues and Gospel Festival at Monday night’s planning meeting at the Delta Blues Museum are (from left) state Rep. Orlando Paden; Melvita Tillis Presley, Catherine Clark, Johnny Kinard, Maie Smith, Pauline Berry, Nancy Foley, and Shelley Ritter. The free festival kicks off Friday, August 9, on the Melville Tillis Delta Blues Stage adjacent to the Delta Blues Museum; continues Saturday with acoustic stages inside six downtown clubs and restaurants and the main stage Saturday night; with the gospel finale Sunday inside Clarksdale's Civic Auditorium. For lineups and additional information, view the festival website: sunflowerfest.org.